20 X GRADUATED HABERDASHERY DRAWERS. BEECH WITH MAHOGANY BACKS & ORIGINAL GLASS FRONTS. BY HARRIS & SHELDON Ltd. 3 X DRAWERS: 19.5" X 14" X 5.75". 4 X DRAWERS: 18.25" X 14" X 5.75". 4 X DRAWERS: 17" X 14" X 5.75". Stunning condition. will try my best to help. Collectors Small Wood & Glass Display Case. Old black paint, original mirror plate with foxing. W: 11" - 28 cm. Signs of use, age, wear, etc. H: 13"- 33 cm. D: 5.5" - 14 cm. Good example of this type of marble top cabinet with no blemishes other than those associated with its age. I'm not going to attempt to guess the provenance, etc. Safe to say it's a genuine piece. Haberdashery shop Wooden Display cabinet. Glass top , in fair condition. 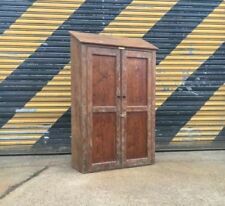 HAND MADE DOUBLE DOOR RUSTIC CUPBOARD READY TO FINISH/ POLISH / SAND ETC. See all our. THESE ARE HAND CRAFTED SO EVERY PIECE IS UNIQUE THESE WOULD NORMALLY BE £195. IDEAL FOR PERIOD STYLE PROPERTY ETC. Maybe an apprentice piece. For sale are set of small collectors drawers. Five small drawers. Very nice little set of drawers in good used condition with the usual age related knocks. Made from plywood with a mahogany veneer. vintage wooden cabinet with 3 drawers,working lock and key. Not sure of its age. Depth of drawers are 8cm 6cm 7cm. This unique and eye-catching piece features four glass sliding doors in white, green, baby blue and navy blue. Super mid century glass cabinet/bookcase. This piece would suit a variety of uses and room settings. Vintage Library filing cabinet, 20 Draw. Retro furniture. Shabby Chic. Antique. This wood cabinet would make an excellent modern piece of furniture with its shabby chic look. Retro furniture. Playful piece of furniture in a laminated wood finish. Top cabinet has x2 glass shelves and a classic mirrored back with a pull out mirrored table / tray for making cocktails or drinks on. Below it has two small pull out draws and a further cabinet below. Surface wear, scuffs, scratches and marks throughout due to age and use. Support the British Heart Foundation's life saving research. Item Condition. We will not accept cash on collection. Vintage pigeon hole or Cubby Hole From Postoffice. 140 x 90 cm. Good condition. Only one shelf broken as seen on pic. Needs a good clean. Hole size 14 x 7.5 cm I have one more for sale - see separate listing. Stylish Retro Record Cabinet with sliding tambour doors to front. Looks to date to early 1960s. In striped grain Tola wood I think. Fully fitted inside with partitions and lined with rexine type material. Stands on slender wooden legs with brass caps. Condition is used wear. Some knocks please see photos. Hence the price. Measures 31 inches long, 15 deep, 26 inches tall. Base shelf interior height is 13 inches, top shelf height 5 inches. One of the nicest retro record cabinets I have seen. Collection in person or I can arrange a courier on your behalf. Please ask for a quote. 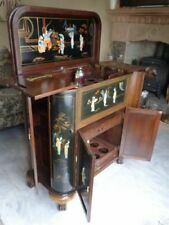 The cabinet is in good condition but could do with polishing. All the glass and mirrors are in good condition. Depth 24cm Holes. · Transfer. · Cash on collection. I will do my best to be available at short notice. Vintage pigeon hole or Cubby Hole Post office. Vintage pigeon hole or Cubby Hole From Postoffice. 140 x 95cm. Some shelves broken as seen on pic. Can be replaced. Easy to remove or swap to make room for books. Needs a good clean. Hole size 14.5 x 7.5 cm I have one more for sale - see separate listing. SUPPLIED WITH GLASS SHELVES WHICH CAN BE MOVED ABOUT. GENERALLY SOUND WITH A LITTLE TLC REQUIRED. DISPLAYS SMALL CERAMICS, MODEL CARS OR TRAINS ETC. 19CM DEPTH. 30CM WIDTH. I don’t know exactly how old the cabinet is, and I’m not an antiques expert, but I’m sure it’s not antique, more a reproduction in Queen Anne style(?). Doors fit well and stay closed. Depth - 40. Stunning Drinks Cabinet - Originally Corner Coat & Hat Cupboard - solid wood with mirrored front door and original top shelf & brass hooks. Top of unit lifts off for ease of moving. Has addition of 2 robust shelves to convert to drinks cabinet (drinks not included) Original brass hooks and 3 prong central swivel hook remain in place, so unit can be returned to original state. Shape & dimensions: Front is shaped - door 25” wide, wings to wall 11”. Length along wall to corner 27” Height to top 82”, with top section removed 75.5” Beautiful detail in the panels and trim. Mirror has some marks, appropriate for age. Downsizing forces reluctant sale. Collect in person please. OR COLLECTORS DRAWERS. 6 FALL-FRONT DRAWERS. APP 22"W X 36"H X 14"D. BY A MUSICIAN UNTIL LAST YEAR. BUT VERY STURDY AND IN USE. I think this is an old record cupboard. 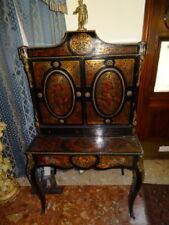 It is in a well used condition with visible wear to the varnished finish. It is 55 cms high - 36 cms deep - 48 cms. 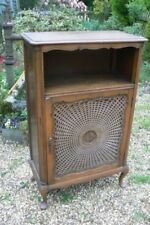 New listingRetro Wooden Cabinet With Wire Mesh Front. Characterful wooden cabinet, would look great in sitting room, bedroom or bathroom. Overall Height to the top of heart motif app rox. Width approx. This is a sweet little 1950's Vinyl Record cabinet. It is in good condition for its age, but the top is a little scruffy and could do with refinishing - maybe a little tlc with a good polish might work. For sale is our vintage china cabinet. It is in good condition for its age which I guess is around the 1930’s period. It has a makers label on the back which is hard to read but I think it’s delivery date is 7/7/ 3? . The glass is all good with no cracks as are the shelves as well. It has the original key which is a bonus! This would restore well or could be used for an up cycling project. Please note this is an old piece and does have marks and scratches on it. Thanks for looking at this item. Vintage display cabinet which has had the front doors removed to create an open unit. The cabinet has been painted in Annie Sloan Amsterdam Green then given a combination of white and dark wax to give an aged artistic finish. Dimensions are 74 x 34 x 124cm Collection from Southam or delivery options available at an additional charge. Follow GJF Furnishings on Facebook for more products and reviews. 24 drawers of various size and finish. This stylish mid century cabinet features 2 sliding glass doors in white and purple. These slide back to reveal a single wooden shelf. Perfect as a bookcase or for storing DVDs, CDs, paperwork etc. The Larder has a Fall-Flap which works well, there are 2 drawers, and a cabinet with etched glass above. and three cupboard doors underneath, they all have ball catches which keep the doors shut. It still retains all it's original clear Plastic Handles. Practical and good looking mid century cabinet. 1920s original 2 drawer cabinet. Collection in person only. Antique Oak Display Cabinet with locking key. Early to mid 20th C solid wood display cabinet. 43" h x 29.5"w x 11" d. Lovely condition apart from a few scuff marks at bottom of door. 2 wide glass shelves. Lighting fitting in place but not tested. Rose etching in middle panel. Locking door with key. This has been well used and as such is showing marks and scratches. Solid and study. Lovely solid sturdy french cupboard in original co edition its very light white grey wood maybe it was lightly washed over once but doesn't look painted ...really lovely detailed grainy wood! Large in size so can get lots in ..was used as a toy cupboard .. 43" long 11" deep 45 high! If you like one off pieces eith their own character then you will love this ! I do...just hsve anouther exciting piece coming! Collection in person or happy to deal with a courier if you want to send one ! 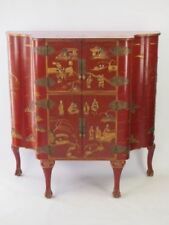 An elegant Georgian wood cabinet with elegantly painted fine fluted details. The aristocratic feeling will add a charming note to the interior of your location.